Vince Lombardi said that “it’s not whether you get knocked down; it’s whether you get up”. To have a crazy time enjoying hitting, rolling and bumping all over the ground look no further, because this extreme hybrid sport arouses both silliness and competition. 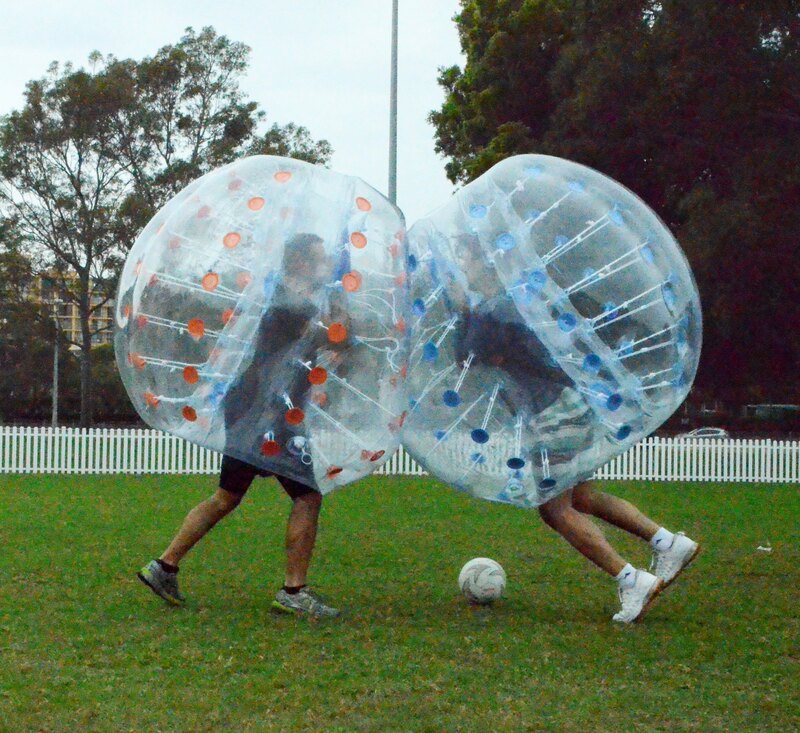 Bubble Soccer is the hybrid of soccer and zorbing, in which you can hit your opposing player as hard as possible. So get ready for some hard bumps. The goal of the game is to kick the ball in the net; it will result in most goals and thus the most points. When the ball crosses over the cross line, under the cross bar, without any violation of the rules and regulations of the game; the individual team goals the score. Winner is the team scoring the maximum goals. A match is played between two teams. No exact limit is defined for the numbers of players in team. Ideally there can be five players per team but not less than four. An unlimited amount of substitutes are allowed per team. Basically, all the teams and players are treated equally. No goalkeepers are designated. There is a bulge area in front of the goal where active players can pass through but are not allowed to stay for more than three seconds. There is no set match duration. It could last two equal halves of 15 minutes each or it could last for four 10 minutes quarters (i.e. mutually agreed between the playing teams and supervisors). Out of bounds does not result in loss of time. The referee has the power to stop the time in case of time outs and medical emergencies. Each team is allowed maximum of 2-3 time outs. Many different styles are opted for playing bubble soccer. It can be played with big goals or small goals, outdoors over the soccer fields or inside the gym. The area of the field is marked by boundary lines. The ball remains “active” unless it goes out of the border near any obstruct where it becomes hazardous for the safety of the spectators or players. If it goes out of the border but remains safe, referee will call “play on” to keep the ball “active”. 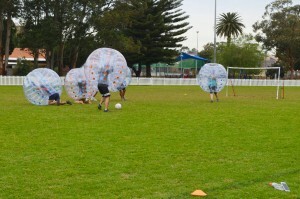 Before stepping into the field each player must be inside the bubble ball. To ensure the security of the player inside the ball; the bubble ball must be inflated fully and is worn across the shoulders using straps. Players must wear proper closed-toe shoes. Studded foot wears are not allowed. Wearing shin guards and knee pads are also highly recommended for safety purposes. Wearing jewelry or any sharp tool during play is prohibited. In addition to providing supervision during the match, the referee also ensures the safety of the players. Hitting the player outside the field boundary is not allowed. However, a hit inside the field boundary resulting the player to fall outside the field boundary is legal. To start the game, the ball must be placed at a distance of 10 feet from the center or anywhere between 20 feet. Players must not always line up exactly on the base line. As the referee blows the whistle players will run for the possession of ball. This will also happen every time after scoring goal. To keep the things simple there is no off-side rule. A free penalty kick may be awarded to the team that was on the wrong end of the foul. A fundamental “on the ground” rule is that the player who is knocked down on the ground must not be hit or contacted again unless the player is on both feet. In every case decision of the referee is final. There should be no objections. Most importantly it is a common social game! So illegal tackling like kicking, grabbing or tripping will not be tolerated in any situation. In case of misconduct of player, misdeed will be handled by the player receiving a warning and on second, player will have to leave the field and game. At the end, having healthy competition in a friendly environment is always the best idea. The aim of the game is to have fun! 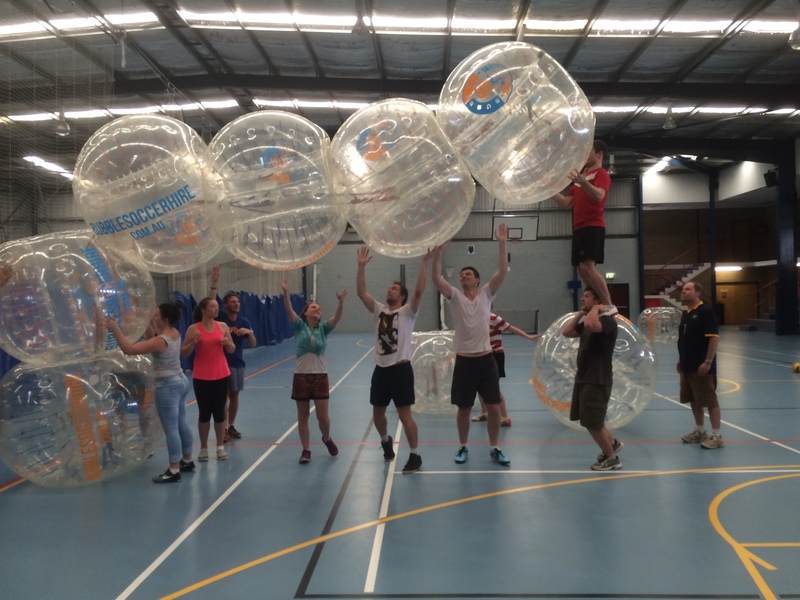 BubbSoc is an entertainment company that specialises in bubble soccer. 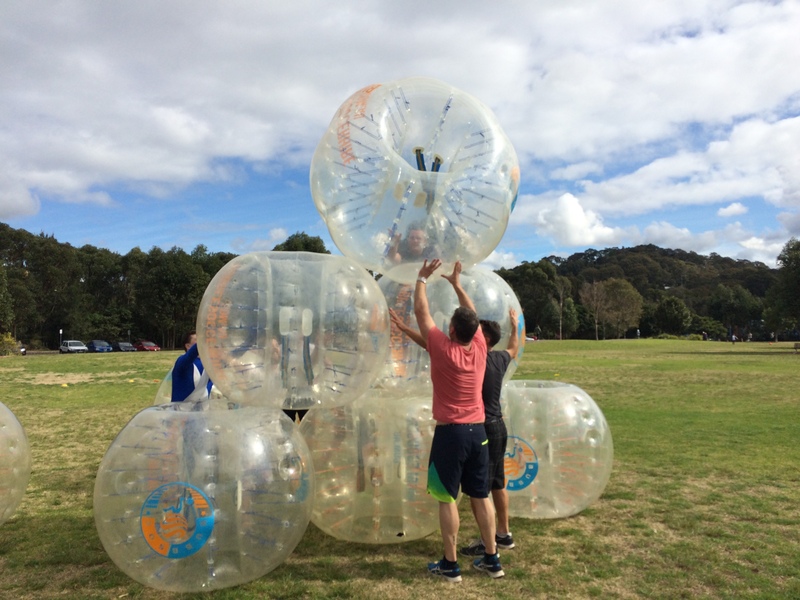 We have been servicing Sydney, Melbourne and Brisbane since 2015 and were one of the first bubble soccer companies in Australia. Contact us on 0423 074 787 or fill out the form to get more information on how we can create an an unforgettable experience for your next event.